Bastion of Islamism: Egypt and the New Middle East | Hayat Alvi, Ph.D. I never thought I’d see it in my lifetime. I lived in Egypt for four years, under Mubarak, and I never would have guessed that within a few years he would be overthrown, and the arch nemesis of the regime, the Muslim Brotherhood (MB), would win an election. Yet, it has happened, and after a very long, drawn out, meticulous reading of the election results on Sunday afternoon, which I presume has served as a torture tactic in Egyptian prisons, finally the commission announced MB candidate Mohamed Morsi as the winner of the run-off, beating the former Mubarak PM Ahmed Shafiq. Of course, the real hard work begins now, in dealing with old and new political institutions, the religious establishment, and the demands of the revolutionaries. Plus, external powers will have to be reassured of the preservation of their regional interests. The status quo persistently lurks in the shadows. In my opinion, neither Shafiq nor Morsi were good candidates for a progressive future. The former represents the Mubarak regime, and the latter’s religious platform generates apprehension especially among many women, religious minorities (i.e., the Coptic Christians), the revolutionary youth movement, and secularists and moderates. Morsi inherits an unenviable task and circumstance, although anyone in his shoes would have faced similar daunting challenges. This is by far the number one priority and challenge that Morsi faces. Tourism has been hit hard since the 2011 revolution, and businesses and industries have suffered losses. Labor disputes have erupted, and in fact a labor dispute is what started the whole revolutionary movement (April 6th youth movement). Getting the economic engine going and in fact getting it to surpass previous growth levels will be analogous to climbing Everest ten times. But, that is what’s needed. Going back to pre-revolution economic status will not be sufficient. For this to occur, the Egyptian economy will have to open up and diversify significantly, plus simultaneous advances in education and training (including technological training) must be implemented. Given the meager literacy rates in Egypt (males 77%; females 62%), that alone will be a formidable challenge. There is already talk about SCAF setting a trap for Morsi, especially given that the constitution has yet to be written. The political challenges are immense, and the uncertainties regarding SCAF’s agendas are great cause for concern. Morsi will have to tread with extraordinary political savvy, and his lack of previous political experience already renders him politically handicapped. He will need the most politically shrewd and skilled circle of advisers around him. How likely that is remains to be seen. Internal ideological challenges within the MB, but also involving the religious establishment, will create factionalism and could engender indecision and/or poor social policies. If Morsi gives in to pressures for instituting strict Islamist policies, many aspects of socioeconomic development and human rights can be seriously derailed and undermined. Another ideological challenge is the impact of regional developments, mainly what’s happening in Syria, which in reality symbolizes the Sunni-Shi’ite rivalry (i.e., Asad’s alliance with Iran and Hezbollah). 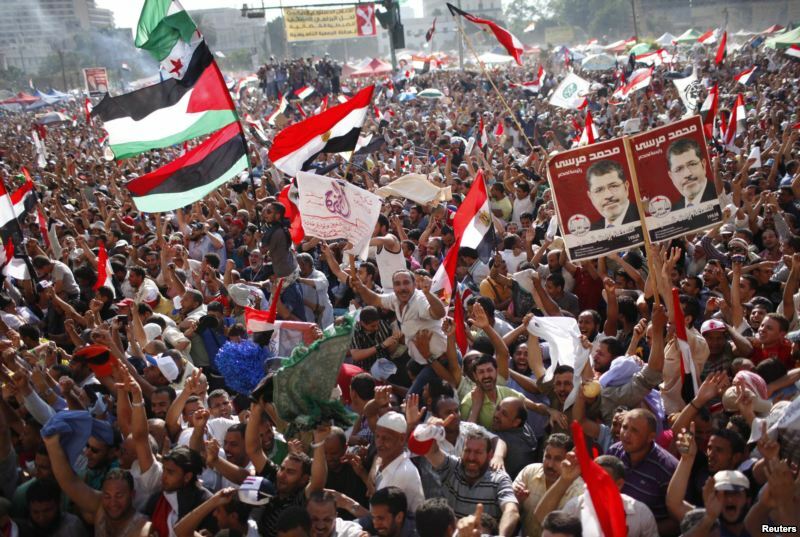 Although Morsi has already expressed improving relations with Iran, the Syrian conflict, along with a possible US-Israeli military strike against Iran’s nuclear facilities, could escalate the sectarian tensions in the region. In that scenario, Egypt will be compelled to side with the status quo. Israel is the number one regional relations issue for Egypt, and Morsi’s position regarding the Camp David Accords will be greatly scrutinized especially by Western powers. In addition, instability in Libya next door may have an impact on political and security issues in Egypt, not to mention the problems in Sudan. Floods of refugees into Egypt have long caused pressures on the local economy, and with continuing conflicts in these neighboring states, it could worsen. Morsi says he wants to improve relations with Iran. Given Iran’s support for the Asad regime in Syria, this might not prove a popular stance domestically, but it is still a step in the right direction, since Egyptian-Iranian relations have remained strained for years. Who knows, at some point maybe Egypt could play a significant role in diplomacy involving Iran and her adversaries in the region and also in the West. If Egypt can rise once again as a major regional player, then that will truly be a huge feather in Morsi’s cap. Egypt’s relations with the US and other Western powers will be critical for her socioeconomic development. The caveat in this is the gauntlet laid down by SCAF, much of which remains unknown, in terms of treading that path smoothly in the transition process. So far, the US has congratulated Morsi upon his win. But, that does not mean that he will not be viewed with skeptical eyes and heavy scrutiny. Moreover, he risks undermining his own credibility if he starts to wave the Islamist flag a bit too fervently. Morsi and his government will have to maintain a delicate balance between Islamism and democracy, and along those lines, the “Turkish model” of the AKP has been repeatedly cited. Morsi and company will remain under the microscope for a long time. Morsi will face many pressures and temptations to invoke and perhaps implement stricter Islamic rules and policies in post-Mubarak Egypt. If he leans more towards such matters and issues, then it will be an indication of his lack of focus on the real priorities of the country, those that pertain to socioeconomic development and progress, alleviating poverty and illiteracy, and improving the quality of life for the masses. If other Islamist parties/organizations are any indication of the direction that they are inclined to take, for example Hamas and Hezbollah, then there is every reason to be skeptical about the MB in Egypt. Islamist groups in the region have failed miserably to illustrate a keen capability to govern effectively and uphold fundamental human rights. In the end, the successes of Islamist parties may render the region a bastion of Islamism, but with nothing substantive to show for it. Let’s see if they can prove the skeptics wrong.